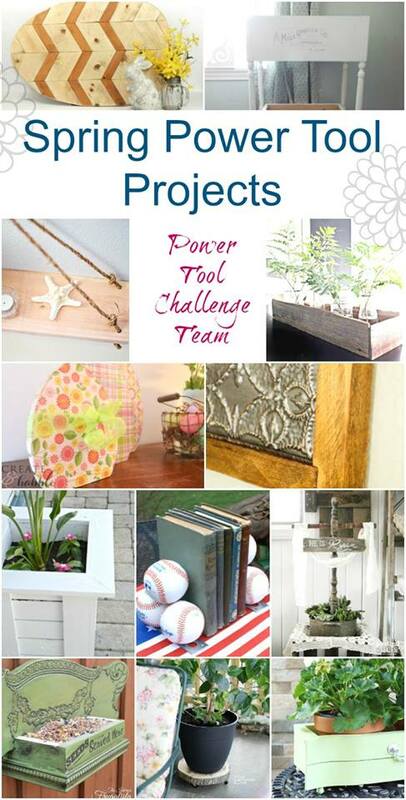 I’m so happy to once again be participating in the Power Tool challenge hosted by Wendi of H2O Bungalow. This month the theme was “Spring” and so I took this opportunity to use some power tools to create an oversized Easter Egg made out of nothing but wood scraps leftover from other projects. The other entries in the challenge this month are also fantastic so make sure you head down to the bottom of the post to see them all! Since this was a scrap wood project I don’t really have a very accurate supply or cut list. The majority of the boards I used were whitewood 1x4s but I also had some 1x3s and a few pieces of 1x2 furring strip that were leftover from previous projects. On that board I traced a really general outline of an egg. It doesn’t have to be exact, but it is really just there to make sure you cover enough surface area to cut out an egg shape. Over the top of my hardboard template I laid all my scrap pieces. For this project I used approximately 5 inch long parallelograms cut at 30 degree angles at each end. The actual length and angle of the cut doesn’t matter as long as they are ALL THE SAME. That is all that is important. I made one and used it as a template.. I didn’t bother actually measuring anything. I was able to cut the out on my miter saw. Just set the angle for 30 degrees and cut away. (This is a great project if you want to get practice cutting non-compound angles!) Then I laid them out over the hardboard making sure i covered the entire surface. Next I had to decide what color the majority of the egg should be. I considered painting it, but I wanted it to be obvious that these were individual boards.. not just a solid piece of plywood painted, so I knew I wanted a stain. I alsowanted to use what I had on hand and my choices were limited. I decided on the ‘Restore-A-Finish’ in golden oak (which isn’t actually a stain at all but more of an oil to help hide scratches in finished wood. We use it on our hardwood floors.. hence the “golden oak” color. ) It brought out the grain and warmed up the wood just slightly.. so I decided on that instead of the clear polyacrylic. Here you can see the difference. The boards on the right are untreated and the ones on the left have Restor-A-Finish on them. The wood grain is a lot more obvious. Next I used wood glue (Titebond III is my favorite) to add the boards onto the backer. I didn’t nail them own right away since i wanted to be able to slide them around and get a tight if it. Only once they were all in place did I go through with my nail gun and the backer board. I decided on the final shape of the egg using a piece of newspaper. By folding it in half I was able to get perfect symmetry. Unfortunately my jig saw marked up the egg a little so I did have to go back and sand the marks off. Luckily it didn’t take off much of the finish. I also sanded the corners and the edges for a clean finished edge. The finished piece is really large, nearly 3 feet across, and it is pretty darn heavy. But I love it and can’t wait to use it on the mantel or over the sofa. I am so glad i stuck with the natural wood tones. I makes it obvious that this is a mosaic piece and not just stenciled with paint or stain. The perfect woodworker’s easter decoration!